This is a collage of items relating to the baseball career of Topekan Harland Coffman, who pitched for several minor league teams between 1948 and 1952. In 158 minor league games, he achieved an overall record of 62-46, with an ERA of 3.19. His best year was 1948, when he went 18-5 for the Independence Yankees, an affiliate of the New York Yankees. He also pitched for minor league teams in Joplin, Omaha, Columbus (GA), Houston, Rochester, and Columbus (OH). In 1952, he participated in the St. Louis Cardinals' spring training camp, but did not make the team roster in the regular season. 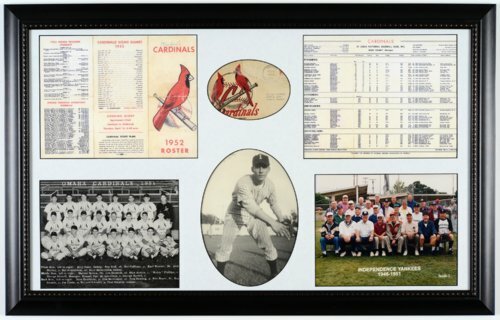 In the top row of the collage are front and back views of the 1952 St. Louis Cardinals spring training roster card and schedule. In the middle of the top row is a partial view of an envelope which contained correspondence from the Omaha Cardinals, the team Coffman played for in 1951. In the bottom row are (l to r): a team photo of the 1951 Omaha Cardinals, a 1948 photo of Coffman as a member of the Independence (KS) Yankees, and a 1996 photograph of former players with the Independence, Kansas teams participating in the Kansas-Oklahoma-Missouri (KOM) League. The Omaha Cardinals photo has a caption identifying the players, which include not only Coffman, but his teammates Earl Weaver and Ken Boyer. The reunion photo was taken in Pittsburg, Kansas, at a KOM League reunion organized by league historian John Hall. In that photo, Coffman is seated in the second row, on the far right. (For identification of all the former players, see Unit 307645.) Harland Coffman was a lifelong resident of Topeka, and worked 34 years for the Topeka Capital Journal. He died in 2010 at the age of 81. Digital reproduction of the collage was accomplished through a joint project sponsored by the Kansas Historical Society and the Shawnee County Baseball Hall of Fame.